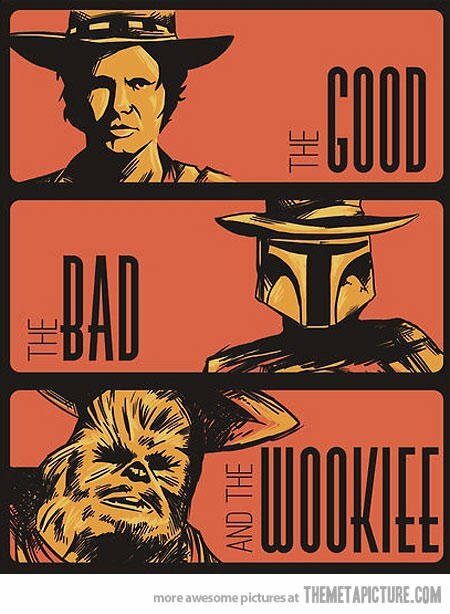 Gartner Magic Quadrant for Business Intelligence (BI) 2017: The Good, The Bad and The Wookie?! Yesterday, Gartner published the 2017 Magic Quadrant for Business Intelligence. The MQ research for BI has been in existence for close to a decade; it is THE document of reference for buyers of Business Intelligence technology. Contrary to last year’s Quadrant, lots changed this year! Gartner declared that the visual-based data exploration capabilities that enabled companies like Tableau or Qlik to disrupt the market are now mainstream. The next generation of disruption will include The Cloud, Hadoop and Big Data. Last year, Gartner trimmed down the list of “Leaders” from 9 to 3. This year, the research firm stayed consistent with its approach in limiting access to the upper-right section of the Quadrant. We are still dealing with 3 Leaders: Tableau, Microsoft and Qliktech. 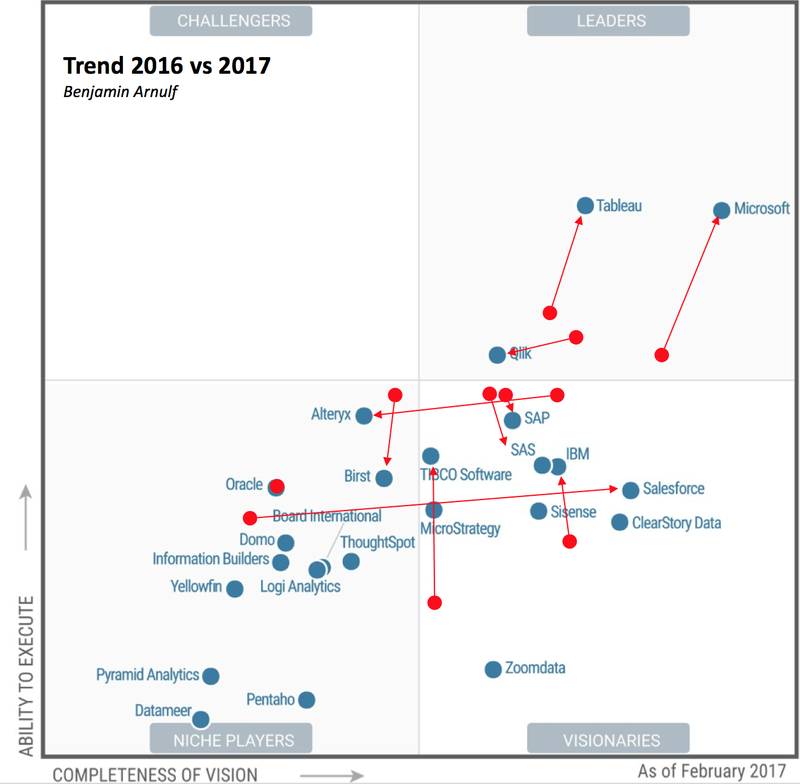 The Tale of 2 Leaders: Microsoft made the biggest move year-over-year, closing the gap on execution and vision on Tableau, Quadrant’s #1. The fact that Qliktech was taken private last year seemed to have slowed down its ascension. While Tableau and Microsoft shot up, Qliktech moved back down and to the left (Qliktech was acquired Thoma Bravo for $3B, a 40% premium to its stock price, in March 2016). Megavendors 3X3: You might remember that, last year, 6 megavendors got kicked out of the Leaders Quadrant: IBM, MicroStrategy, SAP and SAS had moved down to Visionary, Information Builders to Niche and Oracle left the MQ altogether. This year, the treatment for these vendors was split in half. SAP, SAS and IBM stay visionaries and remain slightly affected. However, MicroStrategy regresses quite a bit and Information Builders continues to decline into the Niche category. Larry Ellison will be happy to see that Oracle is back on the MQ (although it appears in the Niche Quadrant?!). He might be less excited about the fact that Salesforce made the MQ’s most impressive jump from Niche last year to the second most visionary vendor this year (after Microsoft). Two trends seem to have particularly affected vendors this year: the featurization of data-preparation and data-wrangling and the necessity to do “Cloud, the right way”. ETL Commoditization: While Gartner acknowledges the need for data-wrangling, it seems to indicate that it should be a feature of a BI platform (the paper refers to Tableau’s Maestro project for instance). The quadrant also indicates that only a small amount of end users need such capabilities. This might explain why Alteryx, a reference in this market, moved from visionary to niche this year. Cloud’s Old and New Guard: while Gartner points to the Cloud as a major disruption in this market, it doesn’t treat all cloud vendors the same way in this quadrant. For instance, Birst and Domo declined significantly year over year and GoodData, which had entered the quadrant in 2013 with to its Cloud-exclusive positioning, is simply gone. I noted that neither Google Data Studio nor Amazon QuickSight were assessed year (probably due to Gartner’s revenue requirements for this MQ). However, I’m going to bet that they will show up next year...in a surprising manner. Indeed, Gartner states that more than 50% of surveyed respondents have active and planned cloud BI deployments (a significant jump year-over-year). Cloud Analytics is a key trend however, its seems that enterprises want more than just a “Cloud-Only” option. A set of additional vendors get ‘dinged’ in this report because they are unable to satisfy enterprises needs for hybrid (cloud AND on-premises) options. 2 out of the 4 new vendors this year came from the Hadoop and Big Data world. And many of the existing vendors were evaluated for their ability to work with large datasets. The issues of speed, scalability and security for enterprise deployments were reviewed numerous times throughout the paper. The Empire strikes back: Now that the “visualization disruption” has run its course, that the old guard BI platforms have closed the feature gap and are putting pricing pressure on the disruptors, how should you plan for your company’s success? Not one of these 24 vendors will become the BI standard in your organization. As Gartner continues to simplify the BI tool landscape for all of us, they recognize that it remains crowded and that diversity of BI tools will remain the norm. Cloud and Big Data could jeopardize your IT’s data standardization projects, if done poorly. Cloud and Big Data projects could test your organization’s capabilities if they are approached as an ‘all or nothing’ strategy. Gartner clearly indicates that enterprises need a hybrid approach (On-Premises and Cloud). The end of the “stacked-approach”? A number of new vendors will emerge over the next few years and they might emulate the “stacked-approach” that companies like Platfora had. The closed “stacked-approach” is at odds with what enterprises need. We believe that the next area of disruption will be fueled by organization’s needs for a harmonization platform, which we refer to as the semantic layer. See more about this here. If you'd like to discuss this further, please come and meet the AtScale team at the Gartner BI and Analytics Conference this year in Grapevine, Texas. Request a meeting with our management team here. The Big Data Maturity Survey Report: We have compiled the results of the Big Data Maturity Survey based on 2,550+ responses from big data professionals at 1,400 companies across 77 countries. The results will surprise you. Download your free copy here. Latest SQL-on-Hadoop Benchmark results: We published the latest Big Data Performance Benchmark, and found 1.5X to 4X performance improvements across SQL engines, including Hive, Spark, Impala and Presto for Business Intelligence and Analytic workloads on Hadoop. Download your free copy here. AtScale in Action: Work with Any BI Tool, Without Any Data Movement, At Top Speed and Security. More here.